Learning how to write is by no means an easy task in any script. It appears however that writing systems with a respectable number of signs are more challenging to memorize. One such instance is Japanese: it has three different writing systems (kanji: over 2,000 signs borrowed from Chinese; hiragana: 46 syllabic signs for the writing of Japanese words; katakana: another 46 syllabic signs for the writing of foreign words). The response from parents and pupils has been enthusiastic, and the series seems to sell like crazy, recently reaching 1.83 million copies. Motivation to study combined with fun is a good thing, thinks a mother who also happens to be a teacher. Because, let’s face it: which 6-year old in his/her right mind would pass on the opportunity to muck about, and have full parental approval while they are at it? A BBC reporter traveled all the way to China, to see, among other things, how electronic devices are affecting Chinese writing. A short video tells the story. It seems that ‘devices in China feature a system that allows users to type words using the Roman alphabet and then select the corresponding characters.’ Chinese writing comprises over 50,000 characters, but some 1,000 are the ones mostly and commonly used, so it was obvious that some sort of mediating writing system had to come between this complex writing system and the smart phone user. Cameron Andersen traveled to Anyang, a city in China’s northern Henan province, and visited the National Museum of Chinese Writing. There, he met with Richard Sears, an American who appears to have dedicated his life to the recognition of the provenance of the Chinese signs, i.e. their etymology (although this term is borrowed from linguistics and has a very specific meaning in that context). It would be unfair to criticize a person’s life work in the narrow space of a blog post, but Sears promotes a theory about the beginning of Chinese writing that is popular with numerous researchers of various writing systems: that the characters can be shown to resemble some object or other, and that their original inspiration came from the copying of said object. The difficulty lies in the fact that we usually have very little evidence for the beginning of writing, and no theory can be suggested to be valid or common for all writing systems. An additional difficulty with this sort of theories is that the recognition of a presumed visual prototype behind any sign involves highly subjective judgements, which can be easily contested by even more subjective objections and alternate judgements. Yet, this theory is appealing, it has become wildly popular and is even taught at schools (Ι remember being taught about it at primary school in Greece). Every now and then some piece of news makes the rounds about the Voynich manuscript, a peculiar hand-written book, kept nowadays at Yale. This time it’s a beautifully made video on the codex. The manuscript is named after a Polish collector and manuscript dealer that acquired it in 1912, but it had a lot of owners before him and after him, before it ended up in Yale. The peculiarity about it is that it is written in an otherwise unknown writing system, in an equally unknown language. Because of its uniqueness, one of the hypotheses regarding it is that it is a fake; yet, carbon-dating showed that the leather (parchment) on which it was written dates to the early 15th cent. Because it remains undeciphered and poorly understood, it has attracted the attention of scholars and public alike; many prospective decipherers have tried their luck with it, but like many instances of unique pieces of writing, the validity of their proposals remains to be proven. Last year, Yale University Press produced the first proper facsimile of the manuscript, and reviews of it appeared in the New Yorker and the New York Review of Books. It is interesting how the theories surrounding the manuscript range from the occult to the conspiratorial. And I have a feeling that this manuscript will not cease to feed into fantasies and prospective decipherments any time soon. A memo (abbreviation of the word memorandum, ‘that which must be remembered’ in Latin), according to the Merriam-Webster dictionary, is ‘a usually brief written message from one person or department in an organization, company, etc., to another’. This past week, however, a different kind of memo made headlines in the US: the recently fired FBI director, J. Comey, is thought to have documented in writing and with detail discussions he had with the American president, D. Trump, regarding a federal investigation Comey was conducting into a former national security adviser. His account of the discussions is also dubbed a memo and is reportedly a common practice among law-enforcement employees: the conversations that are not recorded (and not all of them are) are subsequently drafted into a text, since some of the particulars of discussions and their exact wording is of crucial significance on how events unfold or are interpreted. The Comey memo seems therefore to be an unclassified, unofficial document, which probably means it has no official register number and does not constitute public record. And how did we, the public, then, found out about its existence? Apparently, Mr. Comey himself divulged this piece of information: ‘Mr. Comey shared the existence of the memo with senior F.B.I. officials and close associates. The New York Times has not viewed a copy of the memo, which is unclassified, but one of Mr. Comey’s associates read parts of it to a Times reporter.’ We have no information on how this memo was drafted, but a memo by an earlier FBI director featuring in the news in 2007 was reported as ‘typewritten’. It is probable that the advertised existence of the memo prompted the US Department of Justice to appoint a special counsel to investigate independently the Trump campaign for possible collusion with Russian officials, since the appointment came one day after the memo was made known. It seems also that we will be seeing a clash between traditional note-keeping and modern recordings, since the US president implied in a rather puzzling tweet last week that he had ‘tapes’ of his conversations with Mr. Comey. The special counsel has the authority to get hold of all this information (memos, tapes etc. ), so we will probably find out shortly what was actually discussed. It is clear, however, that if this tweet was meant to serve as a warning against Mr. Comey revealing information, it failed, since he chose to publicize his memo nonetheless. “A McDonald’s in the German city of Mannheim caused a stir on social media on Wednesday after customers discovered a pair of signs in both Turkish and German. The two signs, the franchise owner said, were meant to be inclusive for all his customers. What I found interesting was the comments section in the original story, as it was reported in “Die Welt”. Most of the commentators thought that the reaction was unjustified, since people who reside in Germany, should, in their opinion, learn German and be able to read and communicate fluently in the language of the country; the sign in Turkish was, therefore, for these commentators, superfluous to begin with. Many commented that this was just another opportunity for Turks in Germany to complain and pretend they are victims of discrimination, whereas they themselves (the German commentators) felt discriminated against when a sign was put up in a foreign language in their own country; some also pointed out that they felt discriminated against on behalf of the many foreign nationalities who were not as lucky as the Turks to be represented among the sign languages. Many complained for the characterization of parts of the town as ‘good’ vs. ‘shady’. But virtually nobody saw a problem in the signs. I think what the comments failed to notice was that the signs, if followed by a German-speaking and Turkish-speaking potential clientele respectively, appear to actively encourage some sort of segregation by pointing to different stores for each customer group. In today’s Germany such an effort seems however a bit absurd, not to mention that from a commercial point of view it would be a terrible business initiative. Assuming therefore that the owner acted in good faith, my interpretation is that both signs are addressing primarily a bilingual audience, the Turkish-German one, who would be in a position to read and understand both of them. If these bilingual people constitute the primary clientele for McDonald’s, then the owner simply tried to flatter his customers. I would be the first to cry wolf, but I had a look at the Twitter account that did cry wolf. The account, created in March 2017, is entitled “Türkische Diaspora in Deutschland. Organisiert und entschlossen gegen die antitürkischen Bewegungen” (“Turkish Diaspora in Germany. Organized and decisive against anti-Turkish movements”). They sound a bit conspiratorial and they tweet an awful lot in favour of the current Turkish government and against PKK. In their tweet on this affair they dubbed it immediately as segregation (‘Rassentrennung’). Under the circumstances, it seems rather ironic that a patron who went the extra mile for his Turkish-speaking and -reading clients was denounced by a Twitter account that supposedly monitors anti-Turkish moves. ““His mother, whom he loves”. Ihy was a high priest in the service of the first king of Egypt’s 12th Dynasty—King Amenemhat I, ca 1960 B.C. In his Saqqara tomb chapel, Ihy depicted his mother, Sat-Shendjet, along with the words, “His mother, whom he loves”. ” I have made offerings of incense. I betook myself to the Acacia Tree of the [divine] Children. Sat-Shendjet’s own mother may have given her a name which she hoped would give Sat-Shendjet protection as a “divine child”. Mums are good like that. The Association of European Printing Museums (AEPM) is holding its annual conference between 11 and 14 May 2017 in Chania, Greece. One of the speakers, Georgios Matthiopoulos from the Technological Educational Institute of Athens, will present a paper entitled “The Grecs du roi meet early Cretan literature in a Street Art performance throughout Crete: a school project”. An article in a local newspaper from Chania drew my attention to the conference; that and the fact that I had a number of unknown concepts in the title of the paper! So, it seems that Matthiopoulos put together a project for school children, in which he wanted to combine an early Greek typeface (‘grecs du roi’), with early Cretan literature (the period of blossom: 16th-17th cent AD) and graffiti, the modern street art form. The typeface ‘grecs du roi’ was designed by Claude Garamont himself, the famous Parisian punch-cutter who gave his name to a series of typefaces still used in our digital world (Garamond fonts). Garamont apparently designed by order of the French king in 1541 punches of Greek letters to be used in the printing of books in Greek. He followed models and instructions of the royal calligrapher Angelo Vergezio, who came originally from Crete. His effort was to imitate hand-writing of the time, which however contained a lot of ligatures and alternate ways of spelling words, as the cursive version of any script would. It seems that the result was an elegant, much admired although complicated font, which came to be known as ‘grecs du roi’. Recent research suggested the possibility that Garamont was not in fact the inventor of the typeface, instead they had been developed already by his master, Antoine Augereau, who allegedly had a strong knowledge of Greek and a solid education; it seems that this education caused Augereau his life, because he was burnt together with his books as a heretic by the Inquisition in 1534. Regardless of who invented what, the ‘grecs du roi’ is a beautiful typeface and very recognizable as evidence of Renaissance early typography. 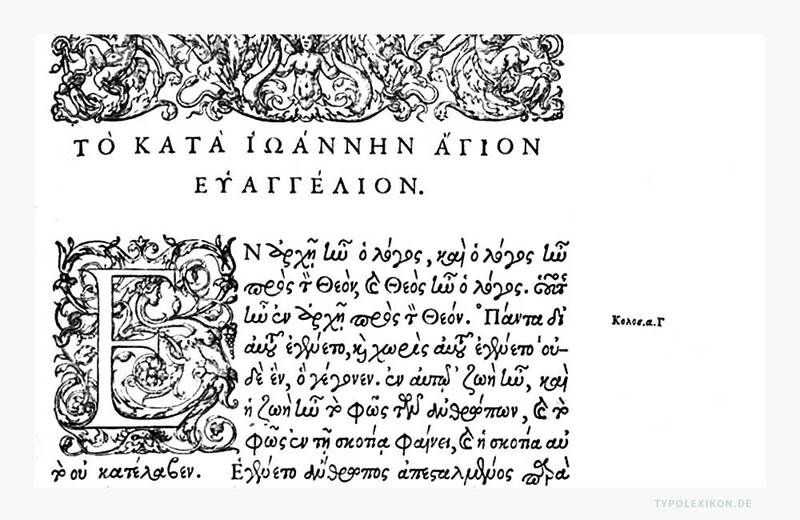 I assume this is what inspired Matthiopoulos to plan a project that brought together this specific typeface, early Cretan literature (the poem of Erotokritos, a famous 17th cent Cretan poem) and school children. The children were called in to paint stenciled graffiti on the streets of Chania, the Cretan city where the conference will take place shortly. The graffiti are verses from Erotokritos.